Mount Abu was the first stop of my backpacking trip through Mewar and Hadoti regions of Rajasthan, done in the second week of January 2016. Mount Abu was never in my initial scheme of things, but it made through on the basis of train ticket availability. 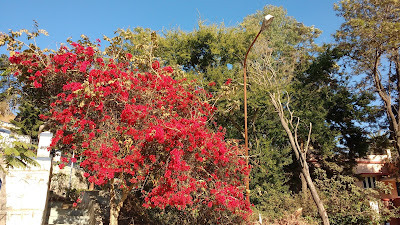 I expected Mount Abu to be like any regular hill-station, albeit with a distinctive Gujrati flavour and it did not disappoint. 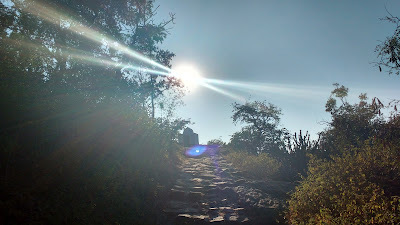 My plan was to reach Mount Abu by lunch-time, take a hike in the evening, explore the place the next day and depart for Udaipur. I took the 19065 Bandra - Bhagat Ki Kothi express on Friday night - almost Saturday midnight. The train reached Ahmedabad with a 30 minute delay the next morning and held on to it as it negotiated the single-line after that till Abu Road. The train reached Abu Road by 1300 hrs. From Abu Road, I took a Rs. 50 shared cab ride till Mount Abu. The cab was filled with local college students out to have a good evening. For a Rs. 100 extra, the cab could also be converted to a 'tourist cab' for local site-seeing. The cab dropped us near the bus station. My first task after getting down was to check for an evening bus to Udaipur. There's only one bus that leaves at 1530 hrs and is operated by Gujrat Travels. I booked a seat for Rs. 250 for the 4 hour journey. One can also rent a motorbike for Rs. 200 onwards for site-seeing at Abu. 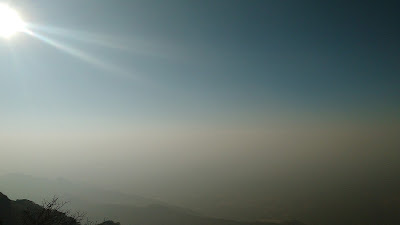 Mount Abu, at Rs. 400, was the costliest place I stayed in through-out my trip. It was also the stupidest Rs. 400 I'd ever spent in a trip (I hope to keep it that way). I'd checked in to the Youth Hostel & Tourist Lodge affiliated to the YHAI. It was not an advance booking, but I must say, I got lazy here. The room was pretty much OK, but hot water was dependent on solar power and only till 10 in the morning; which in the chilling cold of Mount Abu was a spectacularly bad idea. The location too did not add any charm to the place. I also did the mistake of assuming a 24 hour checkout, which actually turned out to be at 9am (6 hours before my bus departure). 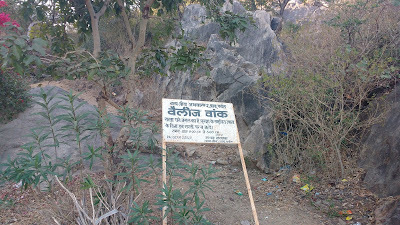 Anyway, this is one of the places to avoid at Mount Abu. You can probably spend some 100-200 bucks extra for a better-than-decent place in Mount Abu. 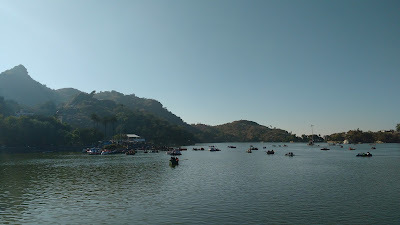 Nakki lake is the de-facto activity centre of Mount Abu proper. Loads of tourists and loads of touristy things to do. This was my first stop for the evening. Bailey's (Valley's?) Walk and Sunset Point. Bailey's Walk starts at the far end of the Nakki Lake, goes farther from Mount Abu and winds its way back to the Sunset Point of Mount Abu. The trail passes through patches of dense vegetation. There is a constant threat of bears crossing certain sections of the trail and hence a solo hike is not recommended. I was joined by two gentlemen working with the Bramha Kumari's Mission who were out for a small hike. They pointed out sections where they had encountered bears in the past. We parted ways near the Sunset Point. The Bailey's Walk begins here ... or is it Valley's walk? The Sunset Point, as the name suggests is a place with a steep fall facing west from where one can see the sun setting all the way down to the horizon. 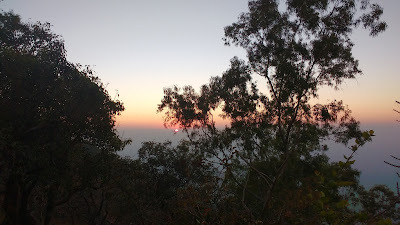 There are a total of three sunset points on Mount Abu and this is the oldest and also the most crowded. Vehicles are not allowed all the way to the point, but these does not deter the tourists as options like baba-gaadi (hand-pushed wagon) and horse-rides are available. I managed to find one isolated corner to view the sunset. 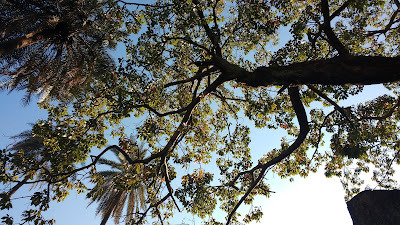 The view was partially obstructed by a few trees, but the relative isolation from the throngs was refreshing. A chilling breeze started as the sun went down the horizon, rendering a possibility of a extended stay fruitless. Post sunset, I met up a contact from Couchsurfing and we decided to explore some trails near the Arbuda Devi Temple the next day. I left the hotel at 0800 hrs, had my breakfast and met up with him at about 0930 hrs. We started on foot to the Arbuda Devi Temple area, but halfway I got a call from my hotel for checking out - I was blissfully unaware of the checkout time till then. 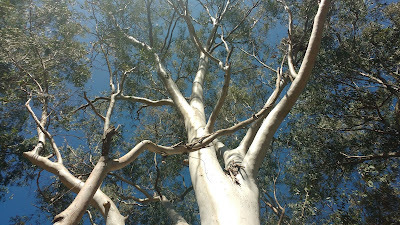 By the time I trudged back to the hotel, checked out and started the walk again it was 1115 hrs. Since we both had to catch the 1530 hrs. 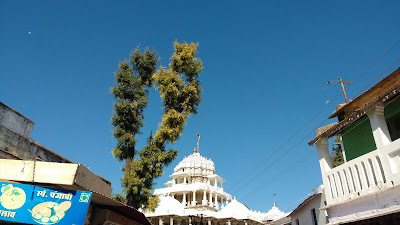 bus to Udaipur, we dropped the plan for the hike and decided to walk up to the Dilwara Temples instead. It was a hike for sure, through the undulating terrain, but on a tarmac road. This place opens for tourists at noon sharp. Shorts and assorted ultra-casual clothing is prohibited. Photography is prohibited too. 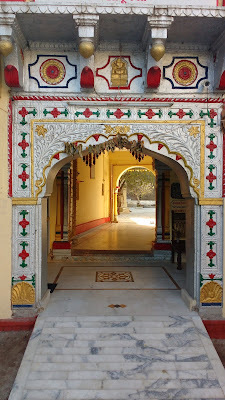 What lies inside the almost-commonplace entry gate is a sight to behold. The temples feature some of the most amazing sculptures in India, carved delicately on equally fragile pieces of marble. Mere words cannot describe this place. Fun fact: Dilwara Temple is actually a complex made up of multiple smaller temples. The main temple, it is claimed, was constructed in 11th Century AD for a sum of Rs. 11 crore (Rs. 110 million). That, after inflation adjustment, would probably exceed the present GDP of the entire country!!! Trevor's Tank is a protected forest in Mount Abu that in general all of Mount Abu dismisses as a bore. We could've hiked there, but were short of time. We reached the place, walked about the periphery and then started the return hike to our hotels. I started off with a light and fast lunch of paav-bhaaji at the Arbuda Restaurant. The food was OK here. Sher-E-Punjab is a good place for non-veg food - tried and tested. Cafe Shikibo has good coffee and free wifi. The best breakfast, I believe, is the ubiquitous omelette freshly made and sold on the road-side stalls. 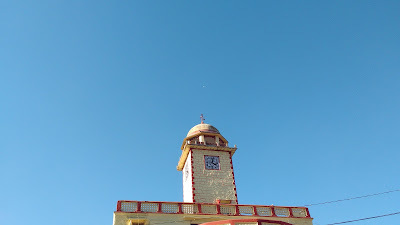 Savouring the good butter-chicken at Sher-E-Punjab was my last 'activity' at Mount Abu. 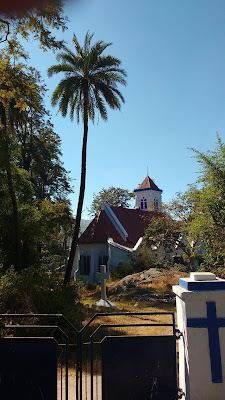 I was a bit pressed for time at Mount Abu and hence could not cover some good places like the Arbuda Devi Mandir, Guru Shikhar and Bramha Kumari's Mission. That and some hiking trails in the area will keep the possibility of a another visit open for me. © KP On The Go! Oh! I thought the board referred to a local misnomer. The maps and guides define it to be Bailey's walk. Curious case. Thanks!